A perfect pair for jazz and small combos. 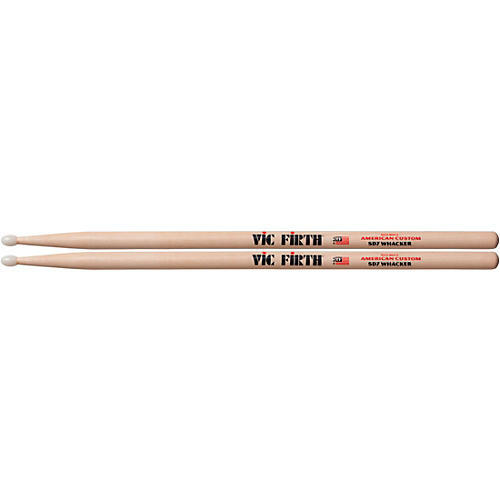 Vic Firth SD7 Whacker Drum Sticks are part of the American Custom line conceived and engineered by performer and teacher Vic Firth. The first manufacturer to apply the concept of a round striking surface to drumstick design, Vic, developed the other original sticks that complete the line with jazz players in mind. Turned from select rock maple for a light, fast-playing drumstick with great flex and rebound, the SD7 Whacker is a perfect stick for drummers who play jazz or in a small combo. The Vic Firth SD7 Whacker has a nylon tip for great cutting power on cymbals. Give these American Custom sticks a chance to jazz up your sound. Order today.